Little seed Canary grass (Phalaris minor) is a monocot weed in the Poaceae family. In Pakistan this weed first evolved resistance to Group A/1 herbicides in 2015 and infests Wheat. Group A/1 herbicides are known as ACCase inhibitors (Inhibition of acetyl CoA carboxylase (ACCase)). Research has shown that these particular biotypes are resistant to fenoxaprop-P-ethyl and they may be cross-resistant to other Group A/1 herbicides. ABSTRACT A field survey was conducted for the sampling of Acetyl-CoA carboxylase (ACCase) inhibitor resistance littleseed canarygrass, a major weed of wheat, from Punjab, Pakistan in 2014 for confirmation of resistance. The surveyed regions encompassed four different cropping systems including rice–wheat, maize–wheat, cotton–wheat and mixed cropping. Dose–response assay was conducted for confirmation of resistance. 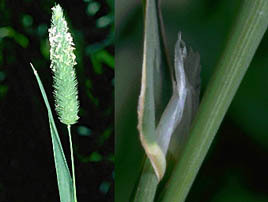 Efficacy of herbicide mixtures including clodinafop–propargyl, metribu-zin, pinoxaden and sulfosulfuron at a range of doses was investigated to manage littleseed canarygrass. Results revealed that all populations were resistant to fenoxaprop except PM-BWL-2. The higher level resistance (6.5) was found in populations collected from rice–wheat cropping sys­tem. The tested herbicide mixtures at 75% and 100% of the recom­mended dose of each mixture component provided the effective control of resistant littleseed canarygrass. Mixtures at 50% provided more than 80% control and reduced growth and seed production poten­tial of surviving plants. The confirmation of ACCase inhibitor resistance as the first case of herbicide resistance in Pakistan, leads us to discourage use of ACCase inhibitor herbicides alone. However, herbicide mixtures at 75% and 100% of the recommended dose are suggested to manage this weed for sustainable wheat production in the surveyed cropping systems. Greenhouse trials comparing a known susceptible Little seed Canary grass biotype with this Little seed Canary grass biotype have been used to confirm resistance. For further information on the tests conducted please contact the local weed scientists that provided this information. There is no record of differences in fitness or competitiveness of these resistant biotypes when compared to that of normal susceptible biotypes. If you have any information pertaining to the fitness of Group A/1 resistant Little seed Canary grass from Pakistan please update the database. The Herbicide Resistance Action Committee, The Weed Science Society of America, and weed scientists in Pakistan have been instrumental in providing you this information. Particular thanks is given to Tasawer Abbas for providing detailed information.